As one of the lead singers in the reknowned rock group Venice, Mark has been performing and recording for over 25 years. His distinctively rich and melodious voice has been heard on radio, television and concert stages throughout the world. 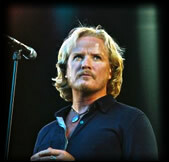 Mark has appeared with countless major artists and is a proud member of the musical Lennon family.